Report filed by Oleg S.
In February 2000, I visited a friend in Amsterdam for a day or two and got caught up in the process of producing a mockumentary based on the city's wealth of miracles. Most of the footage had already been shot, but she still needed to interview some kind of expert on human subjectivity. What she actually had in mind was a psychoanalyst or astrologer, but she soon accepted my offer to pose as a psychogeographer (something she'd never heard of) and vouch with some degree of pseudo-scientific credibility for the importance of the Mirakelkolom. For this, I was going to need some background information. On March 15th 1345, Ysbrand Dommer lay seriously ill at home in the Kalverstraat. He was given the Holy Sacrament but couldn't keep the wafer down. His vomit was caught in a bowl and thrown into the fire, but instead of burning, the host hovered untouched above the flames. The maid removed it without getting burned, and a priest swiftly took it to the Oude Kerk. Overnight, the wafer returned to the house of its own accord. This sequence of events repeated itself, and finally, it having been agreed that God wished the miracle to be made public, the host was transferred to the church in a grand procession. Within two years, a chapel, the Holy Stead, was built on the site, integrating the fireplace. It was consecrated in 1347 and became a centre of pilgrimage. After the Alteration it was used as a storehouse and then, from 1590, by the Netherlands Reformed Church, who renamed it the Nieuwezijds Capel and destroyed the fireplace. In 1908, it was finally demolished, partly due its advanced state of decay, and partly due to the conviction of the Protestant Church Council that this was the only way to erase all trace of the superstitious cult that had taken place there. Fragments were reused in other buildings, and in 1988, a column composed of original segments was erected as a free-standing monument on the Rokin, not far from the original location. Before the Alteration, a procession was held every year to mark the anniversary of the miracle. In 1881, a certain Joseph Lousbergh discovered a 17th century description of this medieval ceremony and, with his friend Carel Elsenburg, decided to follow the original route as a devotional exercise. Their idea caught on, they formed the Company of the Silent Procession, and before long, the Stille Omgang was drawing Catholics from all over the Netherlands, exerting an attraction that has barely diminished since. With all of this in mind, I set about preparing for the interview. Now, in the eyes of a psychogeographer, such a precisely-documented circular route, trodden as part of a public ritual by countless people over so many centuries, might well constitute an invisible feature on the map, a shared reality that manifests itself once a year but is always actively present as common knowledge. Consequently, the column itself, as a key marker along this trajectory, would be similarly endowed with significance. If further proof were required, the psychogeographer might point to the integration of the Stille Omgang into a Provo happening in September 1965, a date far removed in the calendar from the actual procession, where it was followed by a siege of the mayor's residence (to protest against the breaking up of a peaceful anti-nuclear demonstration), and the disfigurement of a monument to General Johannes van Heutsz (who in 1899, after 30 years of war, massacred his way to a final victory in the Dutch colony of Sumatra). So much for historical and theoretical background. Next came the ground work. The Mirakelkolom stands on the western side of Rokin, at the junction with Weijde Kapelsteg. The house next to it (Rokin 72) has De Gouden Bril opticians on the ground floor and a statue on the roof (installed long before the column) depicting a monkey looking down at the pavement through a telescope. Scanning the immediate vicinity for additional details, I found myself standing in front of the Yellow River Bookstore (Rokin 68). What caught my eye here was not primarily the books and objects covering many aspects of Chinese culture (including Kung-Fu figurines and a volume entitled Shen Nong's Miracle Herbs), but rather a small section of the windowpane itself, at head height near the left-hand edge, that displayed an intricate pattern of impacts and cracks, presumably resulting from an attempt to break in with a hammer. There was no denying that this pattern resembled a partial map of Amsterdam, complete with Central Station and concentric street layout. Four blows with the hammer had left neatly indented points, and the glass, which must have been near bullet-proof strength, had splintered only slightly, forming a distinct network of lines. I sketched its main features as accurately as possible in my notebook and set off to find a photocopier. My plan was to enlarge the sketch until it fitted over my own map of the city centre, with one of the impacts matching the Mirakelkolom. Then, I would use the map to locate and visit the other three points. Admittedly, this was going to prove hard to sell to the film team, who would surely complain of the arbitrary nature of my method, but the truth was, I had my own agenda, and I was quite prepared to bend this undertaking to suit it. As I was hoping, one of the other impacts corresponded plausibly with the Multatuli memorial on the Torensluis over the Singel (unveiled in 1987). 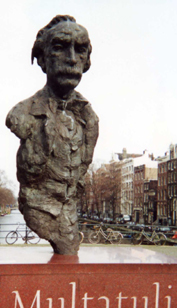 During my only other stay in Amsterdam some 10 years previously, this statue had been a recurring feature and key point of orientation during a whole series of meanderings. As such, it constituted the only other landmark on my own personal mind-map of the city. Although I photographed the stark, limbless figure at the time (hungrily associating the name engraved on the red marble plinth with ratatouille), it was years before I learned the man's true identity and significance, after happening upon a copy of Max Havelaar or The Coffee Auctions of the Dutch Trading Company (1860) in a secondhand bookshop. It was quite definitely time to pay him another visit. It was also time to report back to my film director friend. I called her to arrange a meeting at a cafe overlooking the Torensluis and set off along the Kalverstraat, following the path of the Stille Omgang as far as Dam Square (which, it goes without saying, mapped to a third impact), before veering eastwards around the Nieuwe Kerk, over Nieuwezijds Vorburgwal, and through a couple of Steegs to the Singel. This spot, it transpired, also featured on my friend's mind-map. While researching the possibility of accessing a disused tunnel system connecting houses in the area, she had been told that the shop opposite the café had an entrance in its cellar. By the time we had finished our drinks, the shop was closing, so we hurried over, enquired about the passage, and were shown downstairs to see for ourselves. But that quest would have to continue elsewhere, since there was nothing to see but the usual basement junk and blank walls. Thus revitalised, we went to pay our parting respects to Eduard Douwes Dekker. One detail we had previously overlooked consisted of a small metal plate fixed to the side of the plinth giving directions to the Multatuli Museum, which we followed without further ado: first right, first left, first right, second right, first left, first left, Korsjepoortsteeg 20. As well as being housed in the author's birthplace, the museum contains the chaise longue on which he died, complete with parts of the original red velvet upholstery, and the urn that contained his ashes (he was cremated in Germany in 1887, a time when the practice was still illegal in the Netherlands). But of all the details we learned there, the one that struck the loudest chord was Dekker's dismissal from the post of Germany correspondent for a Dutch newspaper after being accused of filing fictitious reports.